Series devoted to saving treasured heirlooms from the scrapheap. Eric Knowles and his team tackle a 400-year-old painting, a Victorian Noah's Ark and two broken 1930s figurines. Browse content similar to Episode 18. Check below for episodes and series from the same categories and more! I'm Eric Knowles and I'm surrounded by people with broken antiques. They're here to see if we can give them a new lease of life and maybe make a bit of money along the way. Find out how much on Restoration Roadshow. about what's been arriving through the gates here in sunny Derbyshire. It's a beautiful piece of walnut, it just oozes warmth. But what everyone wants to know is, are they valuable? the price tags are in the sort of £4,000 to £5,000 bracket. Are they worth cleaning up and restoring? It would be quite nice to have it restored and then pass it on to my family. -..when it comes to auction? Coming up on today's programme, remember the biblical story with animals coming in two by two? Well, these creatures have had a rough journey. Some of them are in desperate need of a vet. It looks like this Victorian Noah's Ark needs a miracle. And could this 17th century gent be related to the painting's current owner? It's hard to tell beneath all that grime. Oh, no, what have we here? Can we revive them, and will they make some money at auction? We've got lots of bidding on them. cascade water feature makes a lovely backdrop for our restorers. cracked pots and damaged paintings. a charming and unexpected piece of history. the one that filled me with total dread was the story of Noah's Ark. this is not a toy that you've been playing with at any stage. I believe it's from the local museum. Yes, this was donated to the Bakewell Old House Museum. What sort of date has been placed on it? I thought it was Victorian, but I'm told it's Edwardian. Well, here's a bit of controversy, because I don't think it's Edwardian for a minute. is because the later Victorian ones were actually printed with designs. that is definitely painted, which is a good sign, a nice, early sign. These are going to be period, whereas these fellas here are not. The reason being... Whoops, there you go. These are carved wood and these are metal. These may well have been made by a firm in the 1920s or the 1930s. the animal's legs are very thin sticks of wood, basically. -with this many animals for less than £2,500 to £3,000. It's important for you to know that. I thought it was a tatty old thing. Our vet is really a master restorer. Rod Titian learnt the art of gilding from his dad at just 14.
some of which can be found in Kew Palace. it's not going to be restoration, it's going to be conservation. which means that what we're going to be doing is quite minimal. I'm just going to be looking at the structural aspects. and some that are hanging off hinges. The lid is loose here, isn't it? -which has come away. Is it popular? Very popular. It's the most popular toy with children, they love it. So no pressure for me, then? OK, talking of money, do you have a budget that you want to keep to? a fair bit of money on, depending on how far you go. I'll see what I can do, and I always aim to make people happy. emotionally attached to this object, aren't you? in a seaworthy condition, that's all that matters, OK? -I'm sure we can do something about that. I think Noah and his Ark is now worth around about £1,000 to £1,500. and secure the roof for £300. if Rod is going to make everything shipshape. with tricky challenges for our restorers. needed on the inner panel here, I notice. The top has the usual scars of slight misuse and neglect. Oh dear, two headless figures. with Vicky Shore's tragic ladies? and is one of the leading ceramic restorers in the UK. So if anyone can rescue these fair maidens, it's Roger. This is the bridesmaid, and what's the other one you have? A seated lady, also minus her head. So what's the story behind this, how was it broken? which were below and decapitated the poor ladies. Well, let's look at this one first, Theresa. Do you know anything about these? -Do you know what these numbers here mean? so this would be around at 1938, 1940, maybe. No, they're not my style, they're not the style of my home. "Sell them and buy something that you like." Which is a good idea, yes. at the back has broken off. To restore that would probably cost around £120, that sort of figure. I suggest, around £400, maybe £500. So spending £120 on having it restored certainly is quite viable. The bridesmaid figure is something which is not as valuable as this one. and I think in auction, that would probably fetch around £100. and put them in auction? Bang on the nail, Roger. and in this state, these two are worth little more than £100. Roger's estimating £170 to restore, and I do think his value is spot on. to get more than £400 at auction. of making those necklines irresistible. Coming up, a 400-year-old painting. to clean the surface of a painting is saliva. Find out how Rod's coping with that battered Victorian Noah's Ark. And poor old Roger has a case of metal mania on his hands. Plenty of antiques have found their way to Chatsworth. This is a trench map from the First World War. Well, I like that. That's quite ancient, isn't it? like George and Jane Bakewell. We are quite attached to it, we've had it a long time now. Is he somebody that's been in your family for a while? It was a bit of a joke, actually. "We need some ancestors to hang on these walls." my husband came home and said, "I've found your ancestor." So did your ancestor come cheap or did he come at a price? -We paid £3,000 for it. Do you know the artist concerned? Cornelius Jansen, otherwise known as Johnson. he might appreciate a little bit of skin care. Time to call in the expert. at London's Victoria and Albert Museum for 12 years. What can you see that is really needing your attention? and I can see straight away it's had some restoration treatment in the past, which is probably 19th century. is a superficial cleaning of the surface dirt and then a revarnish. and a lot of the scuff marks will disappear. because that's quite a major conservation treatment. But certainly today, we can improve the whole surface. What sort or money are we talking about to do this job? -Yes, I think that's OK.
and I think currently worth around about £2,000. Lucia is going to give it a clean for £250-300. Hats off to any man like George who'd buy his wife a painting. I only hope my other half's not watching. I reckon a few hundred pounds on restoration is money well spent. when she gives this chap a 21st century facelift? Many items you bring to our roadshow need serious attention. it's more about sentiment value than auction price. the cost of restoration can sometimes be simply not worth it. that are definitely showing their age. So, three what look like Derby plates. Where did you get these from? In a box from auction with other things. Ah, the famous box of miscellaneous. their date etc, and value? I've looked it up and they date to about 1903.
which says 3-02, so we know it's 1902, 1903, quite easy to date. What do you want from these plates? Are they something you hope can be restored? Well, just to see what could be done with them. or to have them re-restored, if you like. but like this in this condition, they're almost worthless. assuming they're in perfect condition? I would have thought £100 to £150. because they're very, very collectible. Sadly, they never will be worth anything like that now. so you're probably looking at something in the order of about £50 a plate. As much as I hate this ugly rivet repair, Roger's got it right. They're not of much value at the moment. only reach around £100 at auction. so we'll find out later how they fare. Coming up, Roger's decapitated 1930s ladies prove a bit headstrong. So, will a suitor come forward when they go to auction? Remember this fantastic Noah's Ark? so Rod's been painstakingly painting and piecing it back together. on the bow where it was missing. I'm just putting back a bit of the colour. I'm not really improving it to how it was when it was first made. take the eye away from the areas that are disturbing. Obviously, it's very hard not to go overboard. when doing this kind of conservation work. OK, I'm going to leave that because I don't want to overdo it. It still looks old and as if I haven't touched it. The fact that it still looks as if it needs a bit of work is perfect, as far as I'm concerned. And it's not just Rod who's been working the paint pots. of this handsome 17th century portrait. although using it is a challenge for experts only. because you actually run out of saliva. but what is this concoction actually removing? a completely different texture, much greasier, much greyer. years of it hanging on a wall. once it's been cleaned and revarnished. when it was just covered in this sort of smoggy veil of dirt and dust. will this 17th century fellow make Jane swoon? for Noah's animals? Are you ready? our restorers have been working their socks off. you have to start again. is proving a bit of a headache. because it keeps falling off? is resting. So, we have a very, very easy solution. it rests perfectly in alignment. is that, as you can see, it's a water white glue and it never yellows. Then we just coat the glue on to one surface. Never both surfaces. and I'll leave that now. so I would leave that for, ideally, about 24 hours before I touched it. where he has special tools to fill the cracks and paint the joins. and hopefully the buyers will love them when they go to auction. Back at the roadshow, it's the bit I enjoy best. All our restorers' hard work is hopefully about to pay off. and it's about to be relaunched. I think we're about to experience "revelations", I think. -there's a certain amount of anticipation, yes? -We are. There we go. Go and have a play. It's just lovely to see the gates on. I'd like to keep it for myself, actually, take it home! Maybe you could take it in turns. but now it's totally transformed. while carefully conserving the weathering acquired over the years. are going to react to you going out and spending £300? Could you think of a better way of spending it? and it will get pride of place in our museum. it's conservation, so it's preserving it. What I've done is make it look like it still needs potential work. -It is so much better. It has been a pleasure working on it, it really has. a new lease in life. trying to uncover the true beauty of this 17th century oil painting. Are you excited about seeing your painting? I'm excited, but I'm horribly nervous as well! All right. So, we will do a reveal and let's see what you think. his clothes, he's even got a sparkle in his cheeks. I couldn't agree more, Jane. hidden beneath 400 years of grime. are clear to see, bringing the portrait vividly to life. We can now see this proud 17th century fellow in all his glory. Thank you very much for all your hard work, I really appreciate it. wouldn't look out of place hanging here at Chatsworth. and hopefully they've been able to put a smile on quite a few faces. Here are some of the treasures that passed through their skilled hands. that will preserve this Ark for future generations. He'll take pride of place in Jane's sitting room. we have these unrestored Crown Derby plates, rivets and all. with her 1930s headless ladies? Will they find any admirers when they go under the hammer? It's auction day at Bamfords in Derby. The place is buzzing with people all keen to see what they can bag today. and everything that's been restored will be noted in the catalogue. But before we can begin, it's time Vicky saw her Royal Doulton ladies. the culprit responsible for the damage in the first place. You can't see the join. He's even repaired the little flowers. their pretty heads lying helplessly at their feet. they look fabulous and they can hold their heads high. Roger has really done us proud. now being sold together, could fetch £400. Vicky has put a £300 reserve on them. And now their number's up. There we go, they're being held aloft. -I have got lots of bidding on them. It will start with me at £270. At £270. 280, 290, 300? 300. 300. We've gone to 300. -Come on, one more bid. At 290, that's just so near yet so far. -but they've got their act back together, haven't they? -But it's not all over for us just yet. Next to be served up are Linda's three Crown Derby plates. but surely she'll get a few bob for them. Here we go, we're off. We've got three of them, we don't him to hold up three. -£30? 20 then. £20 is bid to my left. -Where is he going? Come on. -At £20 and two now. -At £20 and two do I see? Come on, boys and girls, lets get it up. Come on, auctioneer. £20, 405, thank you, sir. Well, it's hardly a king's ransom, is it? No, but not a bad result. No, it is a result because they sold, didn't they? Yeah. I got them for nothing so we've not lost anything. They were in a box of assorted items at the bottom, so a result. whose antiques we've saved from the scrapheap. Until the next time, it's goodbye from Restoration Roadshow. 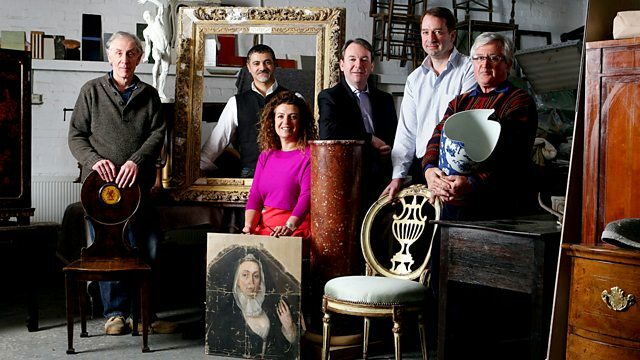 In today's engrossing instalment of the show dedicated to saving family antiques and heirlooms from the scrapheap, picture restorer Lucia Scalisi takes a 400-year-old painting by Cornelius Johnsson under her wing, and a local museum sends out an SOS call to save a fantastic Victorian Noah's Ark. But will Rod Titian be able to work a miracle? Ceramics guru Roger Hawkins also has his work cut out with two delightful 1930s figurines. Unfortunately an accident means they've become headless horrors and Roger will have to work wonders if they're going to catch the eye of the bidders at auction.